Outsourcing has been steadily becoming main-stream even in mid-size companies over last five years driven by the successful case studies in large organization, greater awareness, the explosion of cloud computing and falling costs of communication. 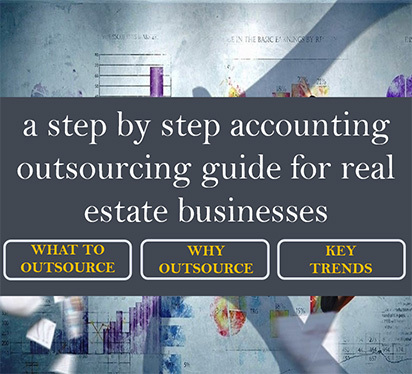 This article aims to be a comprehensive quick start guide for any company looking at outsourcing finance and accounting functions. Expertise: The outsourced vendors have access to skilled employees with various levels of accounting experience to perform your accounting activities. This is especially critical for real estate companies operating in geographies with low access to quality accounting talent. Good Processes: Often mid-market companies have poor process and/or limited process documentation. This creates inefficiencies, reworks, and also increases the learning curve for new persons. For instance, an inefficient or absent accounts payable process leads to arbitrary processing of invoices, built up of invoices locally at regional offices/sites. Once you have decided to outsource the accounting functions of your company, the next step will be to choose the right service provider. How long the service provider has been in business? The success of an outsourcing accounting decision and transaction involves effort and time; therefore make sure that the service provider is in business atleast five years. Reliability of operations is important. Even if the firm is new, review the credentials of the senior management team and investor backing of the business and then decide. It’s also good to know more about the client profiles of the provider. This includes average client size (annual revenues and # of employees), locations, industry and processes outsourced. How will the work-flow be managed in an outsourced scenario? Workflow is defined as the steps required between the receipt of source or input documents and instructions by the outsourced staff from your staff to when the outsourced staff delivers the finished output to you. It will also cover the communication flow between both ends. To develop a sound and effective work flow is an important consideration in outsourcing. What measures will be used to monitor process performance? What are the steps involved in process migration from your location to the outsourced location? The migration phase involves detailing of existing processes, establishing time-lines and formulating a standard operating procedure. For a simple small business accounting process, the migration will be much simpler and primarily focus on setting guidelines for data transfer, monthly reporting formats and establishing communication. Check data security measures adopted by the service provider at their end and ensure that your data is kept safe. Insist the vendor in signing a Nondisclosure Agreement which is punishable under the law if broken. What will be the total cost of outsourcing (apart from the service provider charge out rate)? Get a sense of the total cost associated when you decide to outsource. In addition to paying the service provider, you have to determine the cost and time spent by the staff at your end to manage the outsourcing process. Add costs of IT, remote license and any other charges arising due to the outsourced process. Also make sure of any hidden charges and non-transparent pricing structure. Most service providers have multiple pricing structures to accommodate the need of the client. Hourly rate, transaction based pricing, a fixed slab package or a dedicated accountant fee. Though transaction based pricing seems to be the most suitable, it may be a difficult pricing structure to monitor. It may also be difficult to determine what constitutes a transaction like in case of bank reconciliation. If the volume of work is consistent, then taking a flat fee package or a dedicated option works well. If there is a high variability or short-term assignments, then hourly rates works better. Based on the above information, make a final shortlist of three-four service providers. Research and do a good due diligence on the service providers credentials. Also, ask the references for any challenges or issues that they may faced while outsourcing and how they were resolved. There are four ways by which an accounting file can be accessed- Offline, Remote, Online and Hosted software based method. Offline Accounting File option– Under this method the accountant works on the backup copy of the accounting file, updates the file and sends it back to the client who in turn replaces the updated file with his current accounting file. Remote Access option– Under this method the accountant connects to the client’s computer using a remote desktop access service like GoToMyPC.com, LogMeIn or Windows Remote Desktop connection to work on the accounting software installed at client’s computer. Online Software option– In this method, the accounting software is a web-based file. So the accountant logs in to the online accounting software (e.g. QuickBooks online) and performs the work. Hosted Software option– This method is similar to the remote access based option. The hosting of the accounting software can be in client office LANs or in third party hosting service providers such as Personable.com. The most popular among the methods is the online software option as the method reduces upfront software costs and also ensures hassle free maintenance of software. Based on the above, once you have chosen and selected the right accounting outsourcing service provider for your accounting needs the next step would be to draft the service agreement and lay down the essential terms. Any successful engagement in outsourcing will start with a clear statement of what needs to be done and accomplished. Have a defined scope and schedule of your project. Try setting up priorities upfront, inform the service provider of your requirements and the way in which the work need to be done. This also includes a clear list of services to be performed, the staffing level required and the turnaround time. The level of quality should not be compromised at any cost. 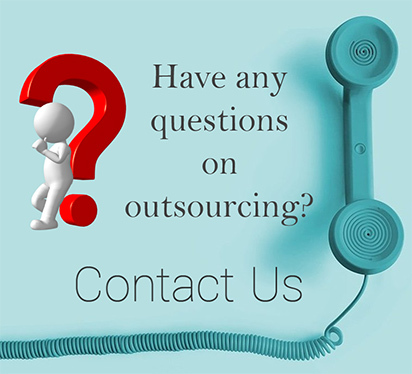 Outsourcing aims at reducing the cost however it should be noted that it is by no means to reduce the quality of work. The accuracy level, turnaround time, reporting formats are a few parameters which could be used to define and measure the quality of service level from the service provider. The pricing structure, variables, slabs and staffing level should be clearly specified. Things to cover for a full-time employee include how many man hours in a month, dedicated or changing staffing, how are staff holidays handled. Similarly for transaction based pricing, a transaction has be clearly defined and should be easily measurable. The termination clause should be clearly defined in the contract. The termination clause is essential if you are not satisfied with the level of services provided by the vendor. Follow the standard industry practice of a 30/60 day notice of your intention to terminate the contract. Insist that your vendor agrees to transfer all files back to you and provide reasonable assistance to a new vendor. Following is an elaborated summary of the dos and don’ts while one looks at engaging with an outsourcing service provider. The decision to outsource can be an easy one. If there is a company that can do the work better, faster, and cheaper than you, give it a TRY. Want to Outsource Accounting Services?